Hotdogs Can Cause Brain Tumor? I have heard that if a child eats a certain number of hot dogs per week that the probability of a brain tumor is tremendous. Is this correct? Answer: No, a child will not be at a greater risk of forming brain tumors if he eats too many hot dogs. However, moms-to-be may want to cut hot dogs and other processed meats such as bologna, sausage, pepperoni and other packaged luncheon meats out of their diets for that reason. Your question probably stems from research that looked for a possible correlation between the consumption of processed meats by pregnant women and the occurrence of brain tumors in their children. Laboratory research performed on lab animals showed that substances formed from sodium nitrites would cause neurological tumors in the offspring of female animals that were fed the nitrates. These findings spurred researches to study human populations and they found that women who ate more processed meats had children who were more likely to develop brain tumors. Later research also found that women who ate diets high in processed meats were also more likely to have babies who weighed less than they should. While there is a correlation between mothers-to-be and childhood brain tumors, that same risk doesn't extend to the children when they eat hot dogs. Actually, while rates of childhood brain cancer went up in the 1970s through the 1990s, the amount of nitrites used in processed meats actually went down. Hot dogs, franks, wieners or whatever you wish to call them are certainly not healthy foods for children or adults to eat even if they don't cause brain tumors in people who eat them. Like other processed meats, they are high in calories and saturated fats. Plus they contain those nitrites, which may combine with other substances to form N-Nitroso compounds in the body. These compounds may be part of the reason why eating processed meats has been associated with a higher risk of cancer, not just brain cancer in children of women who eat processed meats, but also for colorectal cancer in adults. Another reason why hot dogs are unhealthy may be due to the overall diet of a typical hot dog eater. People who eat high fat diets including red and processed meats are more likely to be overweight or obese, plus that hot dog may be taking the place of a much more nutritious fruit or vegetable. Hot dogs are also prone to carry the bacteria called listeria that causes foodborne illness. 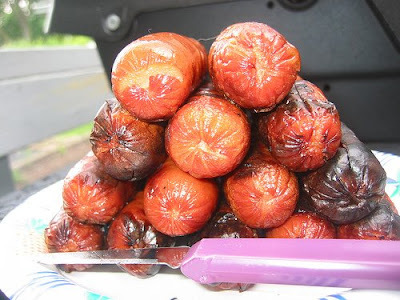 Hot dogs, like all processed meats, should be eaten only rarely. While the occasional hot dog at a baseball game may not ruin your health, frequent consumption of hot dogs and other processed meats cannot be part of a healthy diet.